It's been a while since I've had the heart to post another in this series of "back to the future" pieces. I guess I am just so tired of winning . . . But, hey, looks like the MAGA crowd will have to work a bit harder because we're not yet Number 1! Great news! 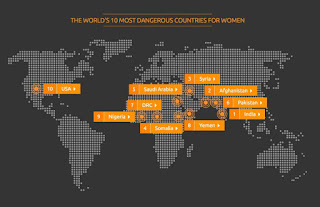 The United States made the list!!!! 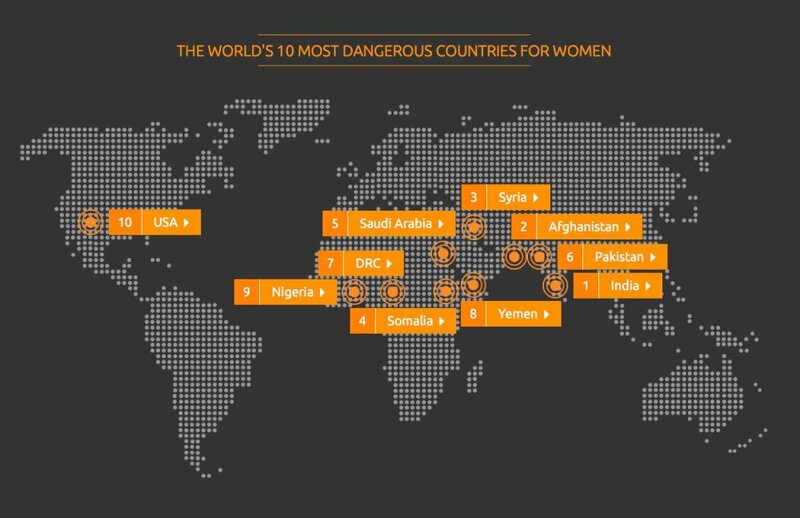 But, darn, just barely--we're number ten on the list, last place: "The United States ranked as the 10th most dangerous country for women, the only Western nation to appear in the top 10." Here is the list, beginning with the worst and ending with the least (?) worst: 1. India; 2. Afghanistan; 3. Syria; 4. Somalia; 5. Saudi Arabia; 6. Pakistan; 7. Democratic Republic of Congo; 8. Yemen; 9. Nigeria; 10. United States. Criteria for ranking: healthcare; discrimination; cultural traditions; sexual violence; non-sexual violence; trafficking. 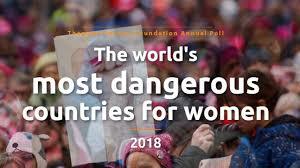 Good to know: we tied for third place Syria on the "key area" of sexual violence, but we were only in sixth place when it came to non-sexual violence. So we'll just have to keep trying harder to make America great again for women! Because we need to be Number 1! And the way things are going these days, if the poll is taken seven years from now, we should be in the Republic of Gilead territory, no problem. By the way, the reactions to the publication of the story are almost as disheartening as the poll itself. The comments at ProPublica are profanity-laden, utterly sickening comparisons of Trump and Bill Clinton--at the time I last looked, there was no reckoning at all with the Reuters poll or story. Meanwhile, over at Jezebel, most of the comments are more-or-less, "Well, we can't accept this poll because clearly Country X is worse for women than the U.S." What an argument. Welcome to America, 28 June, 2018. (On the Way of Ruling and Reigning). emerges from a cloud, above. Not much has been written about Eleanor's early life--well, pretty much nothing has been written. Given her patronage of writers and the quality of the letters she wrote, we might conclude that she must have received an excellent education, but that is guesswork. Later evidence does suggest something of Eleanor's education: she collected her own library, including not only poetry but philosophy and the classics. Two works were dedicated to her, Antonio Cornazzano’s Del modo di regere et di regnare (On the Way of Ruling and Reigning), and Bartolomeo Goggio's Da Laudibus Mulierum (In Praise of Women). In 1465, when she would have been about fifteen, Eleanor was betrothed to Sforza Maria Sforza, the brother of Ludovico Sforza--Eleanor's father made Sforza the duke of Bari. It is not clear whether the two were ever married--but since Sforza died in 1479 and Eleanor was married to Ercole d'Este, duke of Ferrara, in July of 1473, I'm guessing not. Once in Ferrara, she gave birth to two daughters, both of whom would be widely recognized as cultured, educated Renaissance women, Isabella (born in 1474) and Beatrice (born in 1475). She would also give birth to four sons between 1476 and 1480, including Alfonso, who would succeed his father as duke of Ferrara and marry Lucrezia Borgia. 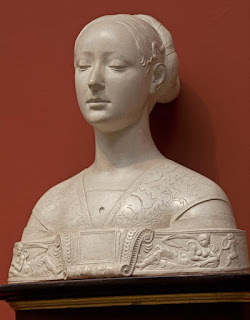 Eleanor's life comes more into focus in May of 1477, when Eleanor, her two daughters, and her son, Alfonso, traveled to Naples for an extended stay with her father, who was preparing for a marriage to his second wife, Joanna of Aragon. In her discussion of this visit, historian Leonie Frieda offers a few details about Eleanor, describing her as "a plain woman who lacked beauty but projected a somewhat majestic persona." Frieda also claims that Ferrante wanted this visit from his daughter on the occasion of his second marriage because she was "strong-minded" and "intelligent." It's also interesting--and perhaps says a great deal about Eleanor's strength--that she gave birth to her second son, in September 1477--while still in Naples. So she had made the journey from Ferrara while she was several months pregnant.The new baby was named Ferrante, after Eleanor's father. Her extended stay was disrupted, however--appointed captain-general of the armies of Florence, Ercole d'Este needed Eleanor to serve as regent of Ferrara. Eleanor headed north, though she left her newborn son and Beatrice behind in Naples, apparently at her father's request. Again Frieda supplies a few descriptons here--she claims that because Ercole "put faith in his wife," it is "testament to her robust political temperament and immense personal bravery." Eleanor is also known to have functioned as regent of Ferrara during the years of 1480-82 while her husband was again away fighting. A letter from Lucrezia Borgia to her mother-in-law, asking for a present of a greyhound, makes it clear that Eleanor had her own kennels and was an accomplished breeder of the species. 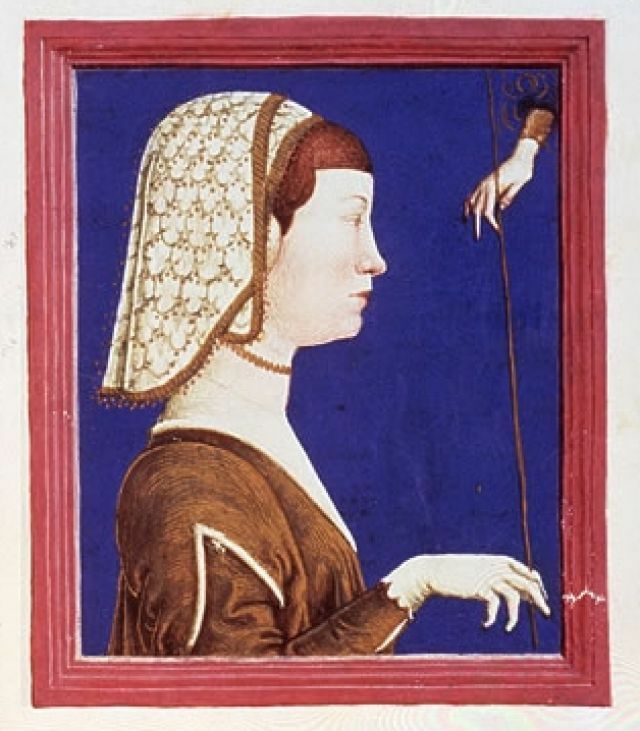 Eleanor of Naples, duchess and at times regent of Ferrara, died on 11 October 1493, just forty-three years old. Leonie Frieda's comments on Eleanor are in The Deadly Sisterhood: A Story of Women, Power, and Intrigue in the Italian Renaissance, 1427-1527. And I really hated that the only woman involved in the whole mess seemed to be Betsy Ross--who sewed! It didn't help that my mother was a great needlewoman and that I absolutely hated anything involving needles and thread. Even then I thought the story was crap, and now I know it is. (For the "myth" of Betsy Ross, click here. But there are many really fascinating women's stories when it comes to the American Revolution--women who resisted the British, women who went to war as soldiers, women who were involved in revolutionary politics, women who followed the Continental Army and nursed, fed, and supported soldiers. 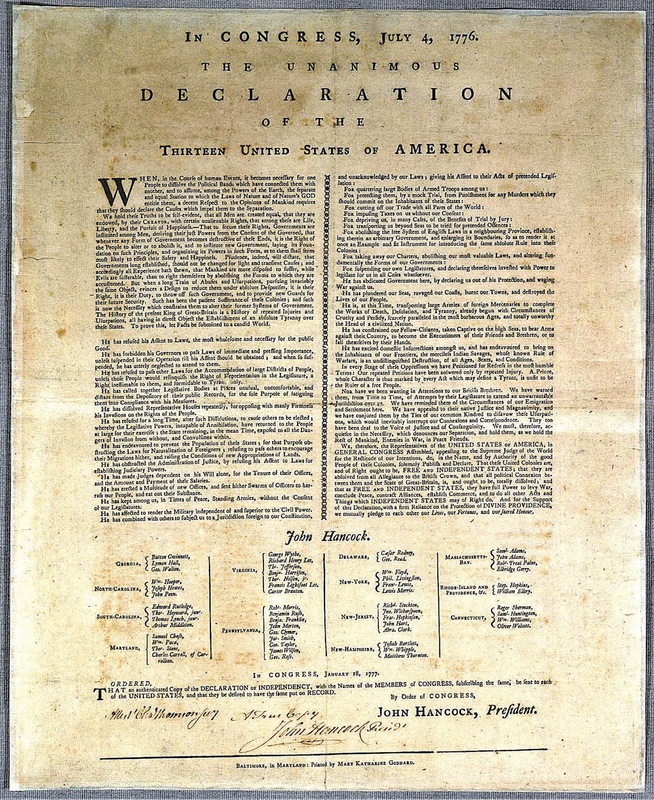 One of the most interesting of these figures, at least to me, is Mary Katharine Goddard, a publisher and printer--she printed the Declaration of Independence in 1777, and although she was the second printer to produce the Declaration, hers was the first printed version to include the names of the men who signed the document. And, right there, underneath their names, was hers: "Printed by Mary Katharine Goddard." Sarah Updike Goddard had been very well educated, taught French and Latin by a tutor in addition to basic reading and writing. Members of her family had emigrated to the colonies in the seventeenth century, and by the time Sarah was born, they were owners of substantial amounts of land and had served in a variety of public offices. Mary Katharine Goddard seems to have been educated by her mother. She worked with her mother and brother, William, in their printing business, but after her brother shut down the Gazette and left the business, the two women continued to publish. They produced an almanac and pamphlets under the imprint "S. and W. Goddard." They soon resumed publication of the Providence Gazette, naming the publisher as "Sarah Goddard & Company." Eventually Sarah Goddard sold the business, and the two women joined William in Philadelphia, where Sarah Goddard once again invested money in her son's publishing effort, The Pennsylvania Chronicle. Again William left the city, moving on to Baltimore. Meanwhile, the two women remained in Philadelphia publishing the Chronicle. After her mother's death in 1770, Sarah continued to publish the newspaper on her own. 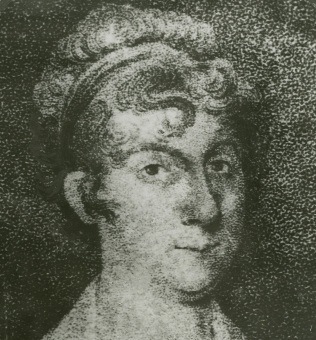 In 1774, she sold the Philadelphia paper and joined her brother in Baltimore, taking over as editor and publisher of the Maryland Journal and the Baltimore Advertiser. She continued publication throughout the American Revolution. At the same time, in 1775, she became the postmaster of Baltimore, probably the first woman in the American colonies to serve in that role. 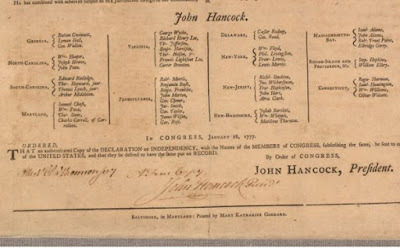 In assessing Goddard's publications during the war, Petula Dvorak notes she, "print[ed] scoops from Revolutionary War battles from Concord to Bunker Hill and continu[ed] to publish after her offices were twice raided and her life was repeatedly threatened. . . ."
In January 1777, responding to the Second Continental Congress's decision that the Declaration of Independence be widely distributed, she offered her press--despite the risks of publishing a document that was considered treasonous by the British. Following a dispute with her brother, she was displaced as publisher of the Maryland Journal, but she did continue to publish on her own. 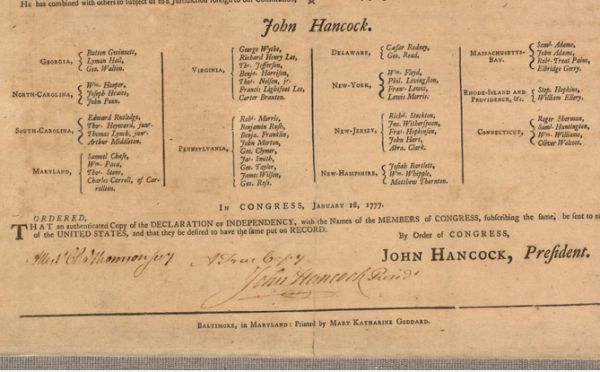 She remained as postmaster until October 1789, when she was removed from that position and replaced by a man--the argument for replacing her was that a man would be able to travel! Her ouster from the role of postmaster seems to have caused turmoil and protest, but despite a petition signed by 230 citizens, that was that. Mary Katharine Goddard continued to operate a bookstore for several more years. She died on 12 August 1816, aged 78. For an excellent biographical essay, posted at the Maryland Women's Hall of Fame website, click here. There is also an entry in the Encyclopedia Britannica, still mostly notable for not including women--but here it is, an entry on Mary Katharine Goddard! 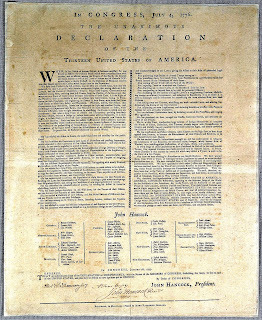 For Petula Dvorak's essay, "This Woman's Name Appears on the Declaration of Independence. So Why Don't We Know Her Story?" (Washington Post), click here. "Printed by Mary Katharine Goddard"
*George Washington couldn't lie about chopping down a cherry tree, but, as Mary V. Thompson notes, he had no problem lying about his slaves--"George Washington showed that he, a man whose reputation was built on honesty, would lie to protect property rights." Just saying . . .
Let's just say I've never been a fan of minimalism--"less is more" is not for me. More is more, as far as I am concerned. And, as an avid gardener, that was my working principle--if three or four tulips were good, a bed of fifty was better. And so for flowers indoors--no ikebana arrangements in my house. One iris and a twisted branch? How about a vase of two dozen irises instead??? 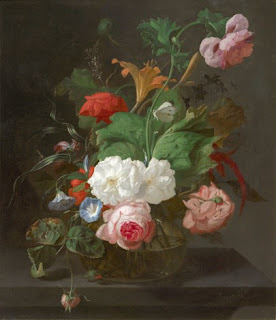 So I have always been a huge fan of the still-life paintings of Rachel Ruysch--lush, exuberant, ample, overflowing . . . According to the Grove Dictionary of Art, she is "widely regarded as the most gifted woman in the history of the subject," Not sure why they limit this assessment to woman . . .
Born in The Hague on 3 June 1664, Rachel Ruysch was the daughter of a noted scientist, Frederick Ruysch, who was an anatomist and botanist. In addition to his studies of human anatomy, he developed embalming techniques and opened a museum for displaying preserved specimens (it sounds creepy, but he made dioramas of his preserved human specimens, especially infants, and they were very popular) as well as items from his collection of flowers and insects. Important for his daughter, he was an amateur artist, some of his own illustrations of his botanical discoveries used in his publications. Ruysch's mother, Maria Post, was the daughter of Pieter Post, a Dutch artist. He began his career as painter of landscapes and battle scenes, eventually becoming an architect noted as one of the creators of Dutch Baroque style. 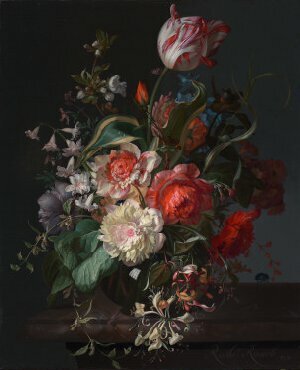 When Ruysch was three years old, her wealthy and prominent family moved to Amsterdam. While she was still a child, she began painting some of the specimens in her father's collection, in particular insects and flowers. At age fifteen, she began formal instruction with the painter Willem van Aelst--she was apprenticed to him in 1679. She continued her training with van Aelst until his death in 1683. One of the lessons she learned from him was the to create the same kind of full, less-formal bouquets depicted in his, and then her, still-life paintings of flowers. While with van Aelst, she had the opportunity not only to become familiar with the work of Maria van Oosterwijck, a still-life painter whose workshop was near Aelst's studio, but she knew other women artists--among them Maria Moninckx, Alida Withoos, and Johanna Helena Herolt-Graff, all of whom specialized in botanical painting. 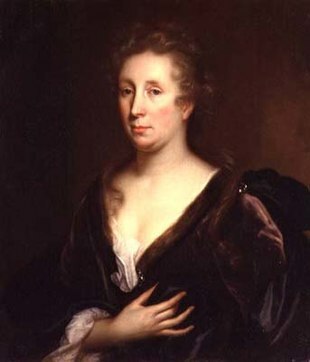 Ruysch and her husband moved to The Hague in 1701, where both became members of the city's professional guild of painters, the Guild of St. Luke. Several years later, in 1708, the couple relocated to Dusseldorf, where they became court painters to Johann Wilhelm, the Elector Palatine of Bavaria. 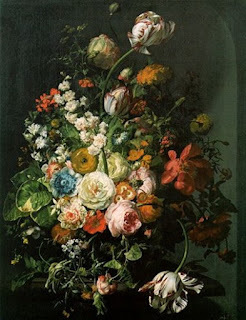 They returned to Amsterdam after the elector's death in 1716, though in the mean time, Rachel Ruysch continued to paint for her Dutch patrons. Rachel Ruysch's final known work was painted in 1747, when she was eight-three years old. She died three years later, in 1750. Unlike many women artists, she did not need to wait centuries for a revival of interest in her work. Throughout her career, she was extraordinarily successful. For an excellent biographical essay on Ruysch, I recommend Luuc Kooijmans's wonderful entry in the Online Dictionary of Dutch Women (click here) or Christopher D. M. Atkins's entry from the Encyclopedia of the Early Modern World (click here). There's a glorious collection of her work in the online gallery at ArtUK (click here).